We have been watching chemtrails sprayed over Kingsville Texas for over two years. I have also witnessed these trails sprayed over many smaller towns in our area. We are located near Corpus Christi and they get a large share of spraying, too. I find it interesting that these jets are deviating to so many rural communities as well as large cities. It is obvious that only populated communities are the "targets" of their operations. I contacted the Corpus Christi flight operations center once to inquire about these jets flying in "X" patterns over our town and was rudely hung-up on by a FAA supervisor. I have also contacted flight operations at Kingsville NAS and been told that the tower was closed and there was no air traffic in the area. I overheard laughter in the background as the air controller answered my question. I just wanted to share these photos taken today 06/09/03 with your viewers so everyone can appreciate the magnitude of this covert operation against the public. We have more "X's" sprayed over Kingsville than we have traffic lights. There's a reason why we have so many chemtrails over Kingsville. 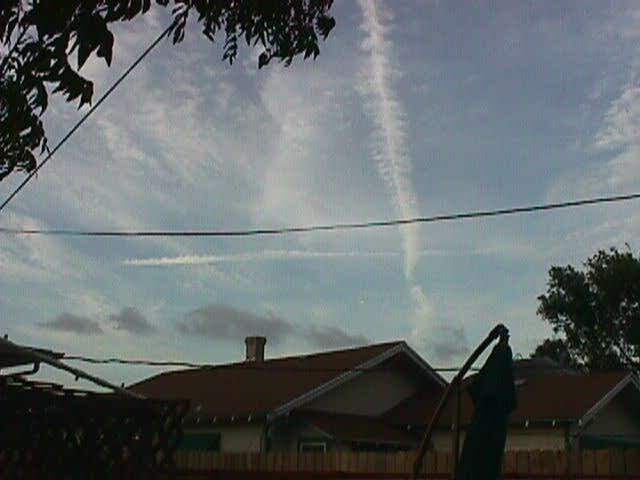 We are situated in an area where many international flights to Central and South America converge (thus the X's formed by chemtrails) and we are also located near a Naval Air Station where flight training takes place as well as being only a hundred miles or so away from the many Air Force bases located in and around San Antonio. I really don't think there's anything involving "targeted operations" against the small communities in this area. I see many more chemtrails over nearby Corpus Christi (which has a population of about half a million) than I do here in Kingsville. Here is a copy of the Kingsville FAA Sectional Chart. Please locate for me and the viewers the "many international flights to Central and South America" that "converge" over Kingsville and form these X's we see. Where are the VOR Flight Paths associated with these X's? They do not exist. You can also review the other Chemtrail reports (Jeff has a site for them) and locate where these flights are converging there also. This was a good try to sharp shoot Chemtrails. Another question Doctor, how do you explain the other wide variety of Chemtrial patterns being reported? I have seen the "Wagon Wheel" patterns, the parallel patterns, and also the pattern that appears to be a large anarchist symbol. 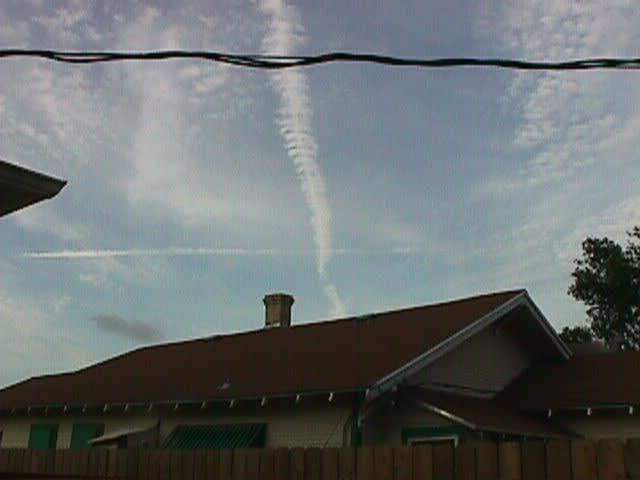 Kingsville does get sprayed as much as Corpus Christi as they are flying their routes over the city. I drive between all the towns here and have observed their round-robin flight paths over our area. These are certainly not converging international flight paths. We can plainly see the Chemtrails being turned on and off as the aircraft enters and then exits over town. 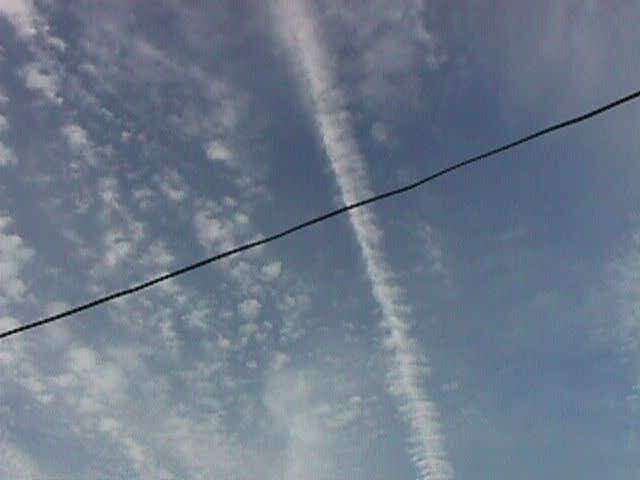 Until three or four years ago these Chemtrails did not exist. Something is going on for sure.